Walls are Sherwin Williams Chaise Mauve. Bench, desk chair, and roman shade fabric from Osbourne & Little. Our Japanese Wall Stencil Collection allows you to explore your inner Geisha. These delicate, lovely stencil motifs taken from classic Japanese designs were traditionally used to decorate Kimonos, lacquer boxes, and ornamental floor screens. Mix these Japanese wall stencils designs with other stencil patterns, or use alone for a contemporary graphics style design. 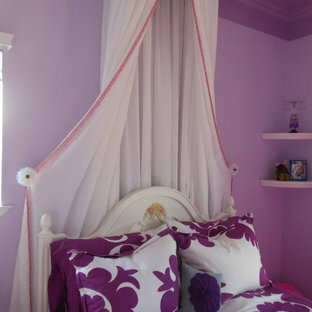 Children's room has a bright color scheme in shades of pink, lavender & teal with wood finishes. The bed platform also has seamless hidden storage. 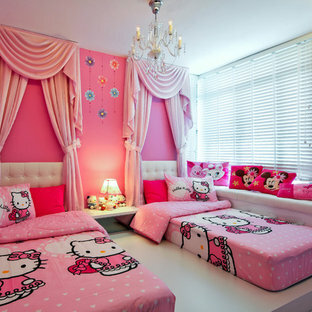 Contact our office concerning price or customization of this Kids Bedroom Set. 347-492-55-55 This kids bedroom furniture set is made in Italy from the fines materials available on market. This bedroom set is a perfect solution for those looking for high quality kids furniture with great storage capabilities to embellish and organize the children`s bedroom. This Italian bedroom set also does not take lots of space in the room, using up only the smallest space required to provide room with storage as well as plenty of room for your kids to play. All the pieces within this kids furniture collection are made with a durable and easy to clean melamine on both sides, which is available for ordering in a variety of matt colors that can be mixed and matched to make your kids bedroom bright and colorful. Please contact our office concerning details on customization of this kids bedroom set. The starting price is for the "As Shown" composition that includes the following elements: 1 Wardrobe 1 Twin platform bed (bed fits US standard Twin size mattress W39" x D75") 1 Nightstand 1 Computer Desk 1 File Cabinet 2 Hanging Door Cabinet 3 Hanging Open Unit The Computer Chair is not included in the price and can be purchased separately. Please Note: Room/bed decorative accessories and the mattress are not included in the price. MATERIAL/CONSTRUCTION: E1-Class ecological panels, which are produced exclusively through a wood recycling production process Bases 0.7" thick melamine Back panels 0.12" thick MDF Doors 0.7" thick melamine Front drawers 0.7" thick melamine Dimensions: Wardrobe: W54" x D21" x H84" Twin bed frame with internal dimensions W39" x D75" (US Standard) Full bed frame with internal dimensions W54" x D75" (US Standard) Nightstand: W17.7" x D14.2" x H17" Computer Desk: W70.9" x D20.3"/37" x H29.1" File Cabinet: W14.2" x D17.5" x H25.6" Hanging Door Cabinet: W36.4" x D13.4" x H12.6" Hanging Open Unit: W36.4" x D12.6" x H12.6"
In hopes of getting their young daughter to sleep in her own room, a couple commits to a sophisticated fairy princess theme with shades of lilac and coral.